Bill Barratt was inducted as a Fellow of the Australian Hydrographers Association on Tuesday 26 October 2016. In 1961, Bill commenced work as a hydrographic assistant with the NSW Water Conservation and Irrigation Commission. Initially, the job was in the Hunter Valley,then in Sydney and Armidale. In 1967 he moved to the Latrobe Valley in Eastern Victoria, as a hydrographer and in 1972 became senior hydrographer. During this period he introduced new generation instrumentation to Victoria and had the Latrobe Double Drum Traveller winch developed by Hydrological Services (HS). In 1978, Des Sherlock, from HS recruited Bill to provide technical support to customers and to develop an export market. Bill became CEO of the company in 1992, remaining there until his retirement in 2005. Under his leadership, HS grew to be a world market leader in hydrological instruments and equipment. Bill has presented technical papers at conferences and carried out training in over 20 countries around the world. Bill has served on the AHA Committee since 2005, being appointed as President in December 2015. Bill has attended every AHA conference. 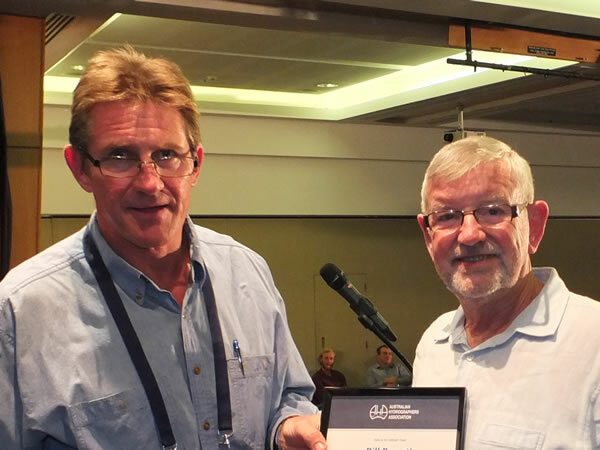 Congratulations Bill for your significant contribution to the profession and your appointment as “Fellow of the Australian Hydrographers Association”.